Club Penguin Cheats by Mimo777 Club Penguin Cheats by Mimo777: 2009 September/October Furniture Catalog Sweet Club Penguin Cheats! 2009 September/October Furniture Catalog Sweet Club Penguin Cheats! Here are the new hidden Club Penguin cheats in the new Better Igloo's furniture catalog for August/September. To find the first hidden item cheat in the new Better Igloos Catalog do this. Step 4. Click page 2 in the catalog. Step 5. Click on the hole on the Ticket Booth. Now you have found the Piano cheat! Step 5. Click to the 3rd page of the catalog. Step 6. Now click on the mirror. Step 7. Stay on the 3rd page of the catalog. Step 8. Now click knob on the stove. Now you have found the Fridge cheat! Step 9. Go to the 4th page. Step 10. Click on the DJ Table. Now you have found the Wall Speaker cheat. Step 11. Stay on the 4th page. Step 12. Click on the Gramophone. Now you have found the Band Stage cheat. Step 13. Stay on the 5th page. Step 14. Click on the Construction Barrier. Now you have found the Bowling Pin Cheat. Step 15. Stay on the 6th page. Step 16. Click on the Stone Column Ruins. Now you have found the Guitar Stand. Step 13. Go to the 6th page. Step 14. Click on the flame in the Bambo Torch. Anyone find what's different about some of the furniture like the newspaper said? Leave a comment! Same Club Penguin Igloo cheats as always. 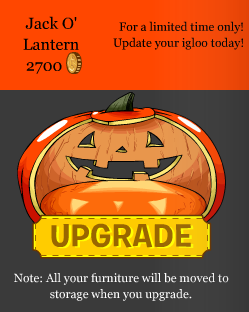 They brought back the Jack O Lantern Igloo! More details on the Secret Mimo Planet Cazmo Party coming soon! hey did u notice that the wheel in the ninja hideout spills out the things we collected? Hey, Mimo, did you see it? :D The sky in your igloo is blue!!! Not orange. LOL! Sweet Cheats Mimo! I Smell a party coming along! Thank you very much Mimo, Zoezoe11,9China9, UFride, Ea12345, and of course, Me Santa for this great opporutunity. Awesome! The machine works if you wave with your Cloud Bracers. Yeah in some places including the Town, the sky's orange. Most of the igloos have blue skys and orange. Hi! I loooove mimo's cheats! There really kewl. Mimo is like, a legend! And I think the Jack-O-Lantern rulez! lol. i cant wait till Halloween XD! yea they should rlly come up with new things for club penguin! Mimo on the Create A New Penguin Page they now have Aqua!! I like the computer! Its so cool! NO! i completed the scavenger hunt, but I didn't get the fire special card! so you are wrong ambassador mario! what happened to stickers303? i thought he was a mimo mod!? -----------------------------------GGGreat Idea! !That would be AWESOME!!! He was a mimo mod but he moved house so he doesnt have internet right now so he couldnt mod. But when he gets internet again we will mod again! Thank you all for the happieness you have given me. I will be tweeting, posting a little bit, and commenting up until my party. I will also not be wearing my regular outfit, for I will no longer be a member. THank you for your understanding. You guys all rock! And CPG is for the win! Stickers303 got removed because he stopped answering questions for some reason. But that happen about 8 months ago. i love the jack-o-lartern room. I WANT IT SOOOOOOOO BADLY! But i have 2 get money so o well.Anyway,thx 4 letting me know mimo.You rock! And i totally love ur blog! I will miss you happywagon you were a great cpg mod.i am definitly coming to the goodbye party!!! Mimo You know the skys orange. Well in the lighthouse the one window is not orange!!! Coco1001 is my Cp Name. Mimo if you go to the hideout you will see the tallest mountain at the sign whit cloud wave bracelets!!!! (a part of it) and we will enter the new room from there!!!! Yep! Though, u gotta wave the cloud bracers... but there isn't a problem with that! Awww....sad face. I will be there though. Hey mimo, do you think that we should have to be a ninja to beat the sinsea? jk.